After 3 flights and (even worse) 5 security checks, we arrived in Uganda! On board the third flight taking us to Kahihi, Uganda, located on the western side of the country, bordering the Congo. We are so excited to be here. We are visiting a government hospital and evaluating whether we think Naweza could be of value here. And I’m happy to report we have been joined by Dr. Rajiv and Sandra and our team is now complete. We made our way to our lodge which we chose because it is a two minute walk to the clinic (and also very cheap). The 35 minute drive to the lodge is beautiful. Rolling green hills and dusty dirt (and very bumpy) roads. There are people walking along the road everywhere, and from time to time a small town with loads of shops. The scene driving to the lodge. We finally made it to our lodge at 5 PM and agreed we’d meet for dinner at 7 PM. Dr. Michael and Dr. Rajiv went directly to the clinic to do pre-op on the patients Dr. Rajiv would be operating on the next morning. While they were there, a 3 year old arrived in the ER. He had been hit by a motorbike and had very bad head injuries, was unconscious and basically was not expected to make it through the night. Dr. Michael examined him and did what he could but his prognosis was grim. They left him with the mother and the nurse on duty and said that they’d be back tomorrow morning. For dinner, we were joined by some of the Ugandans who had helped organize the trip. It was already evident they had worked really hard to bring it all together and they were very appreciative of us being there. Enjoying our first dinner in Uganda with our new friends. Dr. Rajiv and I working on our blogs together after dinner. Dr. Michael – do rounds in the paediatric ward and see patients in the paediatric outpatient clinic. Bruce, one of the staff at the hotel, surprises me with breakfast to my room. I had asked for tea and he brought me the full breakfast! Our short walk to the hospital from the lodge. The 3 year old child who had been hit by a motorbike and who made a miraculous recovery overnight. First of all, I must share that the 3 year old not only made it through the night but was actually sitting up and eating bread and watermelon! It was truly a miracle that he pulled through, let alone so quickly! They will continue to monitor him, but certainly it appeared that he was on the road to full recovery. 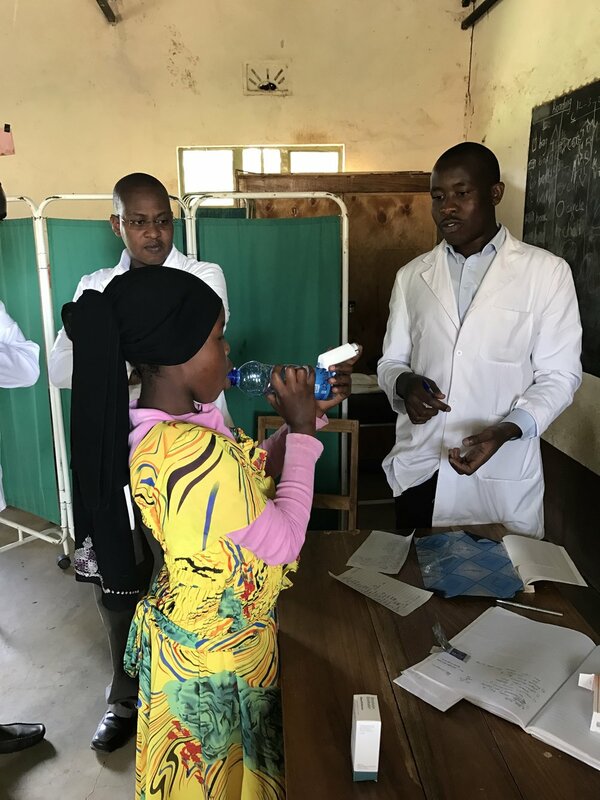 During rounds we were joined by the hospital staff as well as about 20 nursing students who are in the last few months of their 2½ year program. 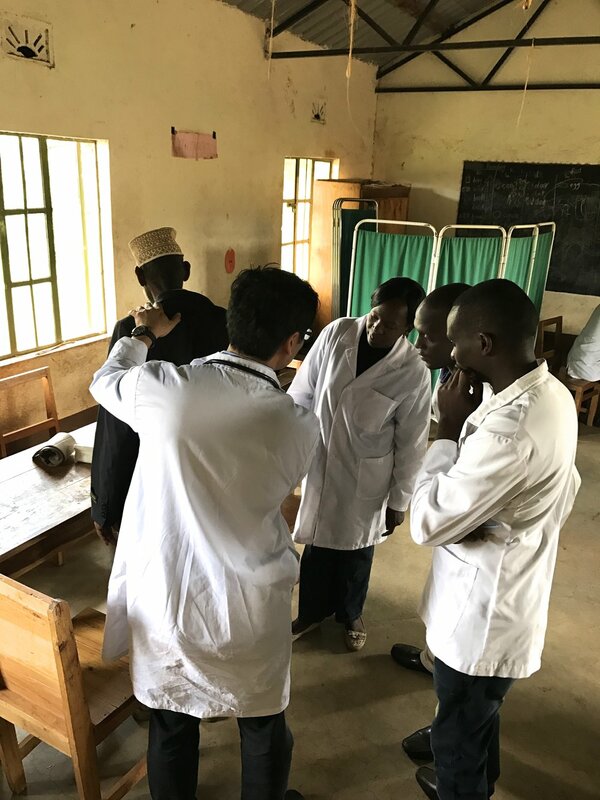 They all huddled around Dr. Michael as he examined the patients and provided rich training and education. 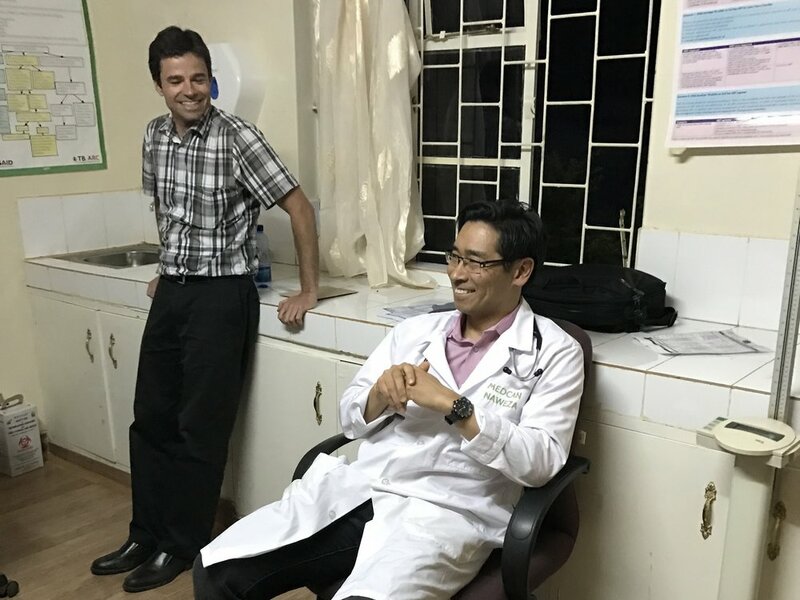 The cases that we saw included a patient who is suffering from congestive heart failure due to undetected rheumatic fever and a 2 year old who has cerebral palsy. Dr. Michael providing training during rounds. A tired mother with her sick child and newborn. I always ask if I can take these photos and all of the Ugandans are very gracious in allowing me to take pictures. The waiting room for the outpatient ward. Dr. James had a good session with his clinician in the outpatient ward. His major observation is that some of the staff are actually quite well trained around chronic disease in terms of diagnosis and treatment. However, the hospital lacks resources and specific equipment. A model that may emerge out of our visit would be to focus our energy less on training and more on investing in pieces of equipment which would support the chronic disease program. We would continue to screen for chronic disease patients using the Community Health Worker program and then use the hospital as a referral center. We also would like to identify a nearby clinic where we could provide training on chronic disease and then only send patients who are at risk to the hospital. 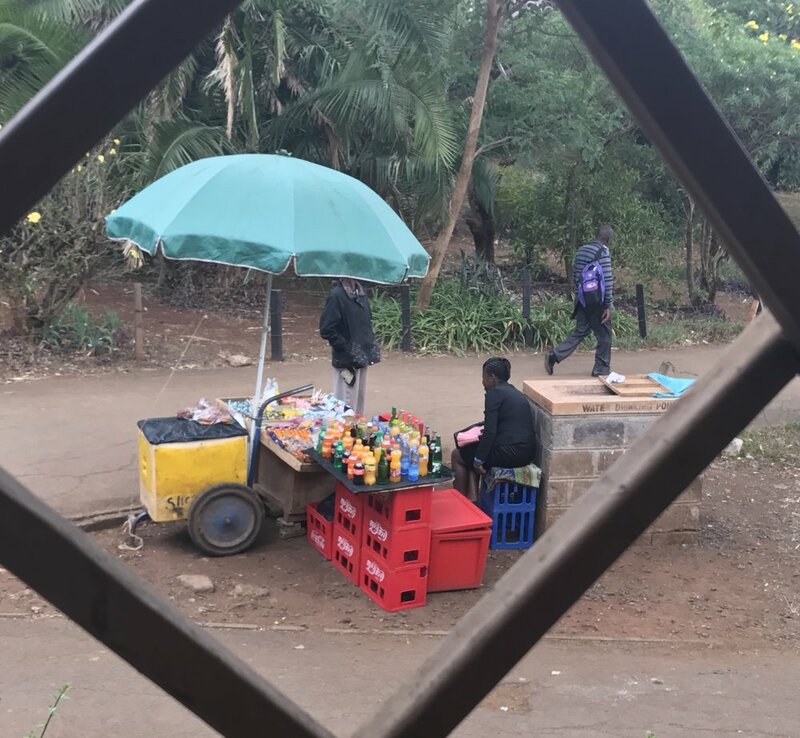 Vanessa met with a Community Health Worker and trained him on the chronic disease educational material that she prepared and gave to the Community Health Workers in Fluorspar and Lewa. It was our first time meeting him and we are quite optimistic that he will be a great addition to the team. Vanessa sitting with our new Community Health Worker and training him on chronic disease. Dr. Rajiv and Vanessa had a good day in the OR. He performed multiple pediatric urology surgeries on children and provided training to the hospital surgical staff while in the operating room. His main observation is that the staff are qualified, however the hospital would benefit from better surgical safety procedures. The hospital lacks adequate safety protocols before, during, and after surgery, which inevitably results in less than optimal results. He later gave a CME to the hospital staff which included a presentation on exactly this topic, highlighting to them that this is an area they need to improve. Dr. Rajiv and Vanessa after surgery. Dr. Sidiqa worked with Alex, the nurse at the hospital who is dedicated to optometry. She was quite happy and even relieved to find that Alex was very engaged and easy to teach. 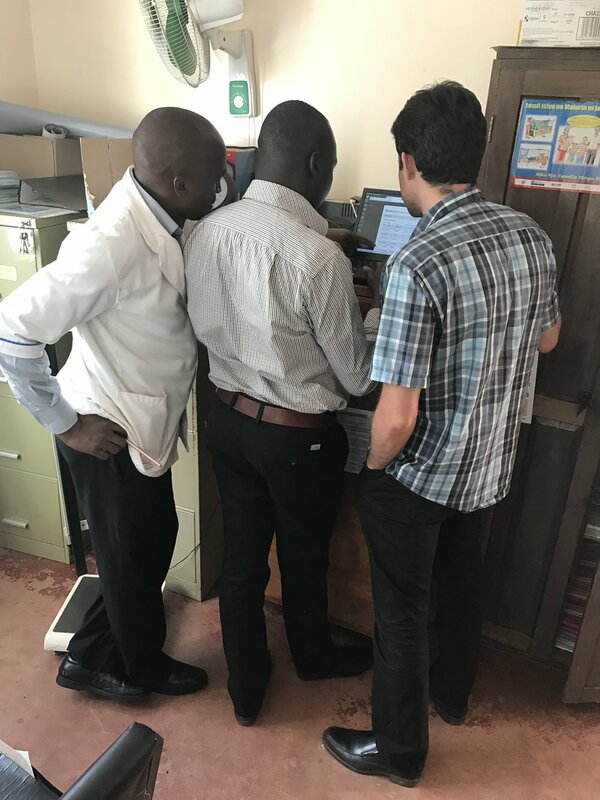 We had taken a bit of a chance because we moved the auto refractor, trial lens kit and ophthalmoscope from Fluorspar to this hospital in Uganda. This is an example of how we believe a model of providing equipment and training around that equipment will be beneficial given the higher level of health professionals here. Dr. Sidiqa and Alex saw about 20 patients, which allowed Alex to practice on the equipment as well as ask Dr. Sidiqa many questions. This will enable him to conduct vision clinics for the community, including assessing visual acuity and general eye health. Alex using the auto refractor we've donated to the hospital. The auto refractor measures visual acuity in order to prescribe glasses. Alex using the trial lens kit on a patient who requires prescription glasses. Alex using the ophthalmoscope on a patient to assess his eye health. A happy vision clinic patient wearing her new glasses! We finished the day with a CME lecture presented by Dr. Rajiv. He spoke to the hospital staff and nursing students about catheters and having proper safety standards for conducting safe surgeries. Dr. Rajiv speaking at the CME. Finally it was the end of a very packed day and we were all very tired. Dinner was at a restaurant back at the airstrip, about 35 mins away. It was a great night, and again we were joined by the Ugandans. It was lovely. Tomorrow we have a similar day planned, with rounds and surgeries in the morning and then outpatient clinics and CME in the afternoon. And of course Dr. Sidiqa will continue training with Alex. But for now, a good night’s sleep!